The terminology may sound similar, but B2C and B2B are polar opposites – and understanding the differences between them may just help you figure out how to land a lead by simply deciphering the category they fall into. B2B marketing usually translates to corporate marketing; your marketing material needs to be sophisticated, formal, and professional, and every conversation you have, both online and off, should be treated like a formal meeting. B2C marketing typically translates to casual marketing; if you try to be overly sophisticated, formal, and professional you’re doomed from the jump. If you even think about sharing a message that isn’t fun and playing off a trending hashtag, you probably get a little uncomfortable. Is it safe to assume that a B2C company markets directly to an end user, whereas a B2B company markets to a group? Consumers set out to buy products or services for their own, personal use. Some considerations they may make before deciding to purchase include the features, benefits and costs – which may ultimately be the factors that end up in a purchase or navigation way. What if that consumer is buying on behalf of someone else – their partner, their boss – even a close friend? They have to “put themselves in the receivers shoes”, and think what they would most appreciate This gets closer to the concept of B2B companies, who market to others – or a group of end users. They may market to the CEO or business decision maker, as well as to the marketing or tech person who’ll use the product. The “customer” in B2B are business decision makers, the executives who make decisions on behalf of the entire organization. These people are invested in making their businesses better, stronger, faster. They want products or services that can help them do that. Deciphering our end-user is the first and foremost step into categorising them effectively, and starting your campaign off on the right foot. If you’re targeting a B2C market, emotions play a vital role in sales; your entire content strategy needs to be designed with this in mind. This includes blog posts, the copy on your website and every other piece of content that you publish. In a B2B environment, data wins. What matters in the B2B environment is the data, the numbers, and the tangible features you offer. Your marketing copy and content marketing strategy should reflect this priority in order to appeal to B2B customers. 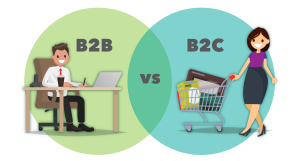 These are some of the major differences between B2B and B2C from a content marketing perspective. Knowing these differences will allow you to create better, higher-converting campaigns through your content marketing strategy. Need help developing a B2B or B2C marketing strategy? Get in touch today! This entry was posted in B2B Marketing, B2C Marketing. Bookmark the permalink.